September and October is Berry Season on Fogo Island. Brilliant sunrises and sunsets fill the skies, the wind is predominantly in the west, and the Island finds itself completely carpeted in dozens of varieties of edible berries. 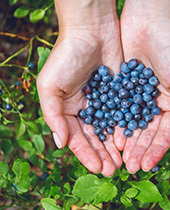 Slightly cooler temperatures make berry season the perfect time to get outside and amble through the barrens and footpaths while scooping up handfuls of blueberries, raspberries, marshberries, and partridgeberries. Meet and chat with Fogo Islanders on the hills as they too will be out collecting the season’s bounty. If you’re lucky, they might even invite you to their secret berry patch… every Fogo Islander has one. 1. Measure all the dry ingredients and combine in a large bowl. 2. Use a cheese grater to grate in the cold butter. Rub the butter in with your fingers to break up any large lumps. 3. Add the partridge berries and mix well. 4. Add the buttermilk and toss to coat. 5. Gently fold and press the dough as you would a biscuit, being careful not to overwork it. 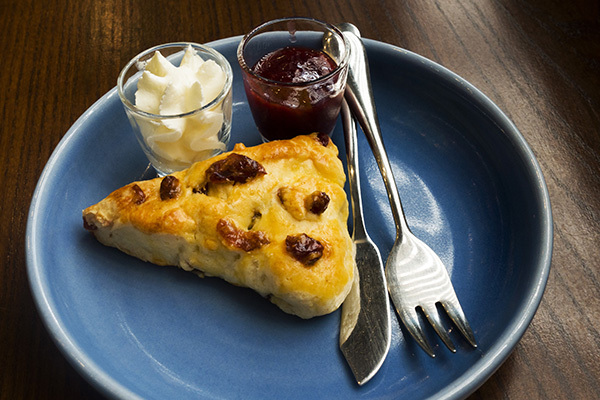 Press together the dough and cut into desired shape for scones. 6. Bake on a parchment-lined baking tray at 375°F for 6 - 8 minutes until edges are golden brown. 7. Remove from the oven and transfer to a wire rack to cool. 8. Enjoy still-warm from the oven, or as a daybreak treat to greet the morning! Join us at Fogo Island Inn this fall, during Berry Season of course.